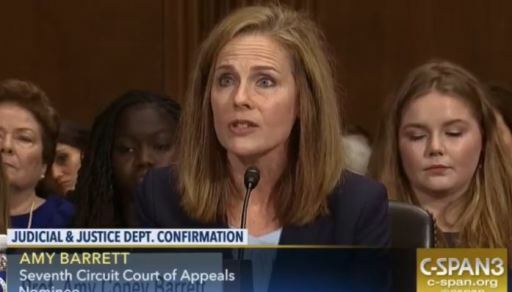 WASHINGTON (CN) – Less than a year after being confirmed to the Seventh Circuit, Judge Amy Coney Barrett has emerged as one of the most discussed of President Donald Trump’s potential nominees to Supreme Court. Barrett cleared the Senate in a 55-43 vote in October, following a contentious confirmation process that centered on the lengthy record of writings and speeches she compiled during her 15 years at Notre Dame Law School. Barrett is one of the 25 people included on the latest edition of Trump’s Supreme Court shortlist, a collection of conservative legal standouts from which the president has promised to choose his replacement for outgoing Justice Anthony Kennedy. A member of the conservative Federalist Society and a former clerk for the late Justice Antonin Scalia, legal experts said the 46-year-old Barrett possesses many of the qualities that the White House has prioritized in choosing Supreme Court nominees. Barrett was reportedly one of four potential nominees Trump met with on Monday. Elizabeth Slattery, a legal fellow at the Heritage Foundation, noted that like Trump’s first pick to the Supreme Court, Justice Neil Gorsuch, Barrett is from outside of Washington, having spent most of her career in Indiana before moving to the Chicago-based appeals court. Barrett has not written much during her short time on the Seventh Circuit, and the few opinions she has penned have touched on relatively mundane areas of the law. However, she did dissent from the circuit’s holding in Schmidt v. Foster, in which the court ruled a trial court denied a Wisconsin man on trial for murdering his wife his right to counsel by holding a hearing in chambers in which the man’s attorney was not allowed to help him answer questions. According to the majority opinion, the man’s trial strategy involved arguing that he was provoked into committing the murder, which would have brought his charge from first-degree to second-degree murder. The judge held a hearing on the defense in chambers so the prosecution would not get a preview of the man’s case, but the man launched into a “rambling narrative” in an attempt to explain himself and the judge ultimately prevented him from making the argument at trial. The majority held the hearing violated the man’s right to counsel, but Barrett dissented, arguing that there was no such violation because the proceeding before the judge was not adversarial. Despite this scant record on the bench, senators will have plenty of detail on which to evaluate Barrett if Trump does call her name next week, as the former law school professor has a relatively detailed track record from her time in academia. That academic writing was the focus of most of the opposition to Barrett during the battle over her nomination to the Seventh Circuit last year, with Democrats using one 2013 law review article to question Barrett’s commitment to precedent. In the article, Barrett examined the purpose of the Supreme Court’s treatment of precedent before arguing the doctrine of stare decisis is not as important as some may claim in maintaining stable legal reasoning. Democrats and liberal groups have also raised questions about an essay Barrett wrote in 1998 examining the role of faith in the work of Catholic judges. Herself a Catholic, Barrett argued Catholic trial court judges might have to recuse themselves rather than impose a death sentence that would conflict with church teaching. During the nomination process, Barrett told Sen. Mazie Hirono, D-Hawaii, that she might face this conundrum if she had been nominated to a trial court, but that a position on an appeals court would put her under no such pressure. Catholic groups quickly adopted Feinstein’s question as a badge of honor and the presidents of Notre Dame and Princeton University wrote letters condemning the questions probing Barrett’s faith. Given Trump’s promise during the presidential campaign to overturn the Supreme Court’s holding in Roe v. Wade, liberal groups have also delved into Barrett’s background to determine how she might treat the landmark decision. A report from the Alliance for Justice extended Barrett’s argument regarding Catholic judges and the death penalty to cases involving abortion, while also pointing to a talk Barrett gave at Notre Dame looking back on Roe 40 years after it was decided. While the article notes Barrett said during the talk that the right to privacy on which Roe is founded is not expressly in the Constitution, it also says Barrett cast doubt on the court overturning the decision being overturned, no matter the makeup of the justices.